A team of Purdue Electrical and Computer Engineering graduate students and faculty has advanced in DARPA’s Spectrum Collaboration Challenge (SC2), to the final phase of a three-year competition focused on finding novel ways for making the most efficient use of the limited amount of available radio spectrum and enabling autonomous collaboration between heterogeneous radio networks. 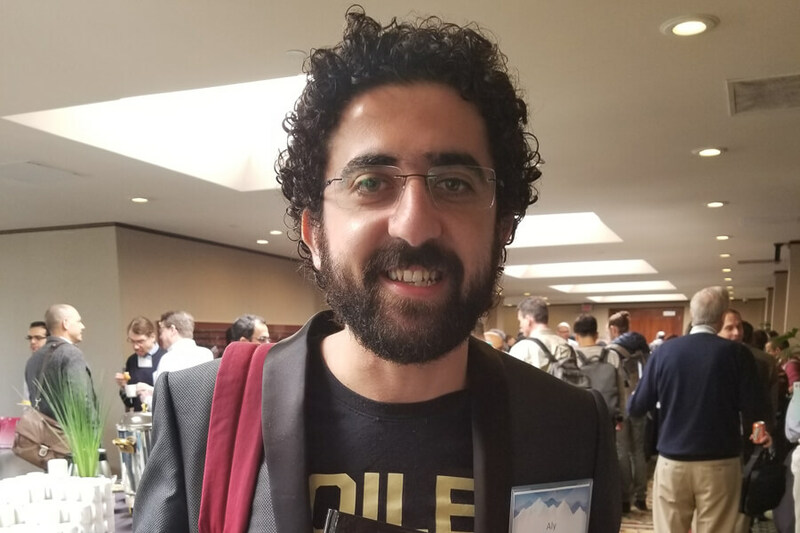 The team, led by Purdue ECE assistant professor Aly El Gamal, includes five research groups from ECE, one research group from Texas A&M, and a research scientist from Raytheon BBN Technologies, and is one of the 15 finalists competing in the third and final phase of DARPA’s Spectrum Collaboration Challenge (SC2). The competition began in 2017, with each phase of the competition requiring a solution to advancing challenges. The Purdue-led BAM! Wireless (BAM stands for Boiler Makers and A&M) team first won a $500,000 contract award in Jan. 2017 to develop its Phase 1 radio network. The team then won $750,000 by placing among the top 10 teams at the first preliminary event of SC2, which charged competitors with using artificial intelligence to develop ways for radio devices to manage use of the radio spectrum autonomously. In addition to teams from universities, the top 10 teams in the event included independent engineers and software developers along with defense companies BAE Systems and Northrop Grumman. The BAM! Wireless team came about through the College’s Preeminent Team on Efficient Spectrum Usage, which was founded through a competitive process in the College of Engineering. The team was awarded multiple faculty positions and equipment to initiate spectrum-related research. The Preeminent Team on Efficient Spectrum Usage is led by David J. Love, the Purdue Nick Trbovich Professor of Electrical and Computer Engineering. Prof. Love and ECE Prof. James V. Krogmeier, who are also leaders in BAM! Wireless, led the Purdue and BBN team in the DARPA First Spectrum Challenge. The experience developed through that first competition greatly helped with kick starting the BAM! Wireless team’s effort in SC2. In January, BAM! Wireless advanced through the second phase of the competition by placing among the top 5 teams in the second preliminary event and meeting DARPA’s Payline criterion of whether collaborative, autonomous spectrum management can outperform the status quo of manual spectrum allocation. As a result, the team won a $375,000 prize award. The DARPA SC2 team visited Purdue in March to review the team’s work and ongoing preparation for the final event in October. Prof. Melba M. Crawford, the Associate Dean of Engineering for Research, introduced the team in an open presentation and indicated how thrilled the College is about what the team has been accomplishing. “This competition enables us to apply the skills we developed in our courses to a real-world, cutting-edge research problem that will influence the future of our communication systems. Us students have spent countless hours writing code and designing algorithms and we are looking forward to put them to test against the best of the best in the championship event,” says Dennis Ogbe, an ECE Ph.D. student and member of BAM! Wireless. In the military, there is growing reliance on unmanned platforms, from underwater sensors to satellites, and a push for broadband connectivity. Managing this increasing demand, while combating what appears to be a looming scarcity of RF spectrum is a serious challenge. SC2 teams are developing breakthrough capabilities by taking advantage of recent advances in AI and machine learning, and the expanding capacities of software-defined radios. In February, SC2 was presented in a session at Mobile World Congress in Barcelona, and the Under Secretary of Defense for Research and Engineering was among the attendees. The SC2 competition simulates communication without the luxury of a central authority such as the FCC allocating bands. Teams operate in a chaotic spectrum environment with little rules and large amounts of data to convey through multiple devices deployed in a geographic area. Despite this daunting setting, teams such as BAM!, have shown that communication is possible using advanced adaptation, learning, and signaling. To test competing systems, SC2 developed the Colosseum at Johns Hopkins University, which can run real-world scenarios to figure out which spectrum management algorithms work best. Thirty teams had access to the Colosseum in the first year of the competition. Participating teams have been competing against each other monthly in training scrimmages and went through qualification rounds before each preliminary event to narrow the field to qualified teams that traveled to Johns Hopkins for the in-person preliminary event competitions. At these events, the Colosseum ran hundreds of scenarios to determine which spectrum management algorithms worked best. The teams will continue to test their designs and scrimmage against each other in the Colosseum. The final competition will be held as a live event in October at Mobile World Congress Americas in Los Angeles. The top three teams will win $2 million, $1 million and $750,000, respectively. The prize could be used to further Purdue’s preeminence in intelligent wireless communications research.